I’ve been having a bit of difficulty trying to figure out my feelings toward Splatoon since it made its first appearance at E3 earlier in the year, so I was quite keen to actually try it out for myself at PAX Aus. My wavering feelings were only intensified as I waited in line, watching the groups of eight ahead of me get their turns. I could see many of their faces as I waited, and I didn’t see too many smiles. On the contrary, there were many who looked either really focused, or possibly just bored. Interestingly enough, Splatoon is still a curious creature, even after getting a bit of time with it. One reason I’ve been on the fence is because it’s primarily a multiplayer game, much like Team Fortress 2. TF2 is incredibly fun when played with the right group of friends, but if you hop in alone you may find yourself stuck against a group of professionals who whoop you every time, and I can easily see the same happening with Splatoon too. That all being said, I had a pretty great time with it, especially in the second round after using the first round to get used to the controls and handling, and I can see it being a stellar party game. 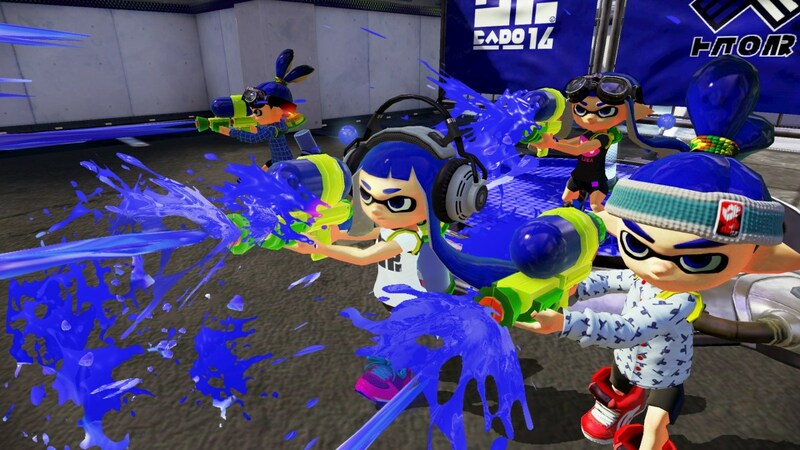 It is truly the epitome of “it’s not over until it’s over,” as every splash of ink is vital to covering the arena in your team’s colour, with takedowns of enemies earning you bonus points. The gameplay is smooth, and I encountered no hiccups while playing. Load times seemed completely reasonable, and the vibrant colours made the game pop, especially when my character popped out of the ink to run around. Its cartoony graphics look great, and will surely be a huge hit with young boys and girls alike. One other thing I feel obligated to point out was that the Splatoon area featured 8 televisions hooked up to 8 Wii U‘s, each player using the Game Pad to play. Now, I am certain you will be able to use the Wii Remotes as well (or instead of), but it was interesting that they had everyone using a Game Pad. Really, the only use the Game Pad had, aside from the controls, was showing a top-down map of how the arena is currently covered. Kind of useful, but overall distracting since you should really just stay focused on the task at-hand of splattering your ink all over the place. In any case, since I am unsure whether you can fill empty spots with CPUs (like, could my wife and I play 4v4, each with a team of 3 CPUs? I don’t know, but that would help matters greatly), or if we be required to hop online to find randoms to play with. That’s not really what we want to do, so the multiplayer focus is admittedly a bit of a turn-off for me. Having said that, this week’s Nintendo Direct has conveniently pushed a bit of those worries away. I wouldn’t want to drop the money on a game I’m going to play once a month, if that, during our monthly games night. However, the Direct featured a new trailer for Splatoon (which you can see below), which introduced the single-player campaign of the game. The 4v4 arena-based multiplayer aspect is still very much the central focus, but having a single-player story mode in addition is very likely what will net them the sale from me. So yeah, Splatoon may not be for everyone, but if you’ve got some mates looking for a bit of inky, cephalopod-inspired fun, or kids who like to just make a mess of everything, this is a game you’ll want to keep your eye on. Splatoon is being developed by Nintendo exclusively for the Wii U, and is expected to release in Q2 2015.